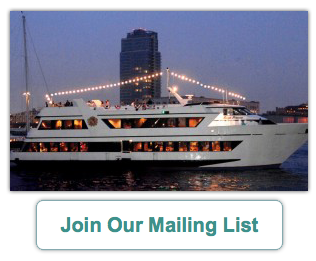 Florists: NY Boat Charter Event Planners have relationships with the best florists in New York City and New Jersey. They’re professional and their work is exemplar. From our experience working with a lot of florists, we highly recommend The Portable Garden and Langdon Florist. Event Décor: We recommend Kathleen Brochin (973-715-7449). She has over 25 years experience organizing both large scale and intimate special events at well-known venues as well as non-traditional event spaces throughout the Tri-State area. DJs & Entertainment: We have fabulous In-House DJ’s at NY Boat Charter. DJ Oscar and DJ/MC Dan know how to feel the energy of the party and play what is appropriate for each group on board the Royal Princess. They make a wonderful team for weddings. If you have your own DJ and want to rent our sound equipment, no problem. If you’re looking for live music, we can arrange for different styles. Tour Guides: If you need someone savvy about NYC to show you the town, Becky Hoffman (770-330-0780) is a NYC Tour Guide we know well. She brings much enthusiasm and knowledge to her personalized guides to the Big Apple. Other Private Yachts: If Royal Princess is not the right fit, we can match you with the boat or yacht that meets your needs. Whether it’s a small boat for 2 guests, or a large party for up to 1,200 passengers, we are the one source for your private yacht chartering needs. Please visit our sister company, NY Yacht and Boat Charter.